Speaker W.J.M. 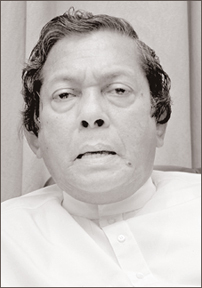 Lokubandara completed the full tenure of his office in the sixth Parliament until he was succeeded on April 22, 2010 by Chamal Rajapaksa with the unaniomous vote of the Parliament. Impressed by the policies of Mahinda Chinthana, Lokubandara joined the UPFA after the dissolution of the Parliament and his name was included in the UPFA National List. Instead of being an MP, he was sworn in as Governor of the Sabaragamuwa Province on April 21. In an exclusive interview with the Sunday Observer, the new Governor says that it was only a temporary appointment until the Constitutional changes are made to reintroduce the Senate as contemplated by the President. Q: How do you review your political career? A: I have been in active politics for 33 years. I entered the Parliament in 1977 as the MP for Haputale electorate. President J.R. Jayawardene appointed me as the project Minister for Indigenous Medicine. Later I was appointed Cabinet Minister of Cultural Affairs and Indigenous Medicine. President Ranasinghe Premadasa appointed me the Education, Cultural Affairs and Information Minister. During Presidency of D.B. Wijethunga I was also in charge of the Technical Education Ministry. In 1994 I was elected the Chief Opposition Whip. When the UNF came to power in 2001 I was appointed Minister of Justice and Buddha Sasana whilst being Leader of the House. In 2004 I was elected Speaker and held the office till the dissolution of Parliament in April, 2010. Q: You began your political career as a member of the United National Party. Now you have joined the SLFP. What made you to change your party? A: It was the significance of the Mahinda Chinthana that inspired me to change the party. It was the Mahinda Chinthana policy that helped liberate the country from the clutches of terrorism. Q: But you continued to be a member of the UNP whilst being the Speaker? A: The office of the Speaker is an independent one. As such my role too had to be independent. I never attended any political meeting when I was the Speaker. It was only after the dissolution of the Parliament that I attended political meeting at Badulla where President Mahinda Rajapaksa appointed my son as the Haputale SLFP organiser. I was never present in any political platform until the dissolution of the Parliament. Q: Your name was included in the UPFA national list. But you have been sworn in as the Governor of the Sabaragamuwa. Are you happy with the new appointment? A: My name has been there in the UPFA national list that was sent to the Elections Commissioner. When allocating the National List seats, the party leadership had to set apart slots for constituent parties of the Alliance. There were problems when allocating seats for political parties. However, I accepted what the President offered to me. I was also assured that I would be appointed President of the Senate once it is reintroduced. Till such time, I shall function as the Governor of Sabaragamauwa. Q: Does it mean that this new position is a temporary one? A: Yes, this is a temporary position for me till the Senate is reintroduced. Q: Are you confident that the Government can go ahead with Constitutional changes? A: Certainly yes. The UPFA government is a strong one with near two third majority in the parliament. President Mahinda Rajapaksa achieved all those victories when there was no absolute majority in the parliament. With this near two third majority he can go ahead with the required Constitutional changes. The Speaker was elected unanimously. Therefore, there is no doubt that the President can go ahead with the constitutional changes. Q: Your son also entered parliament from the Badulla district. Does it have any connection with your new appointment? A: No, certainly not. My family believe in the Mahinda Chinthana. My son firmly believe in the Mahinda Chinthana. He appreciated the President for eradicating terrorism. We are all indebted to the President for it. As a mark of respect I voted for him at the Presidential election. As the Speaker I was also targeted by the LTTE. The President increased my security. I have always allowed my children to peruse their own thinking. That was why he decided to join the President. Q: On Thursday the parliament unanimously elected Chamal Rajapaksa as the Speaker of the seventh parliament. In 2004 you were elected Speaker with only one majority vote. How do you see the new situation? A: In 2004 I was the candidate from the United National Party. Chamal Rajapaksa has been elected Speaker after the overwhelming victory of the government at the recent election. The Government has a near two third majority in parliament. When I was contesting for the Speaker from the UNP the entire Government and the then President was against me. Today the situation is entirely different. Q: Are you satisfied with the role you performed as the Speaker? A: Certainly yes. I cultivated the virtue of equanimity, 'Upeksha' throughout the period when I was functioning as the Speaker. I studied the Constitution and the Standing Orders of the parliament. When I went through the Standing Orders a noteworthy fact I found is that the Standing Orders are formed for the government to have its way and the Opposition has its say in the parliament. I as the Speaker irrespective of party, religious and ethnic differences guaranteed the MPs of their right to speak. With the consent of the House I also allowed the question and answer time to run upto one full hour. Earlier it was 30 minutes. With this, the Opposition was provided adequate time to question the Government on issues they were interested in. I did not face any no confidence motion during my tenure. I enjoyed the full tenure of the Speaker from April 22, 2004 to April 22, 2010. Very rarely Speakers have completed their full term. I also safeguarded the rights and privileges of the MPs. My attitude was completely non-violent because I am a religious person. I always followed 'Calama Sutra' when conducting the parliament. As Speaker, I took steps to promote national integration ever in the parliament by celebrating Vesak, Christmas, Saraswathie Pooja and Ifthar as annual events. Another important thing I did during my tenure was the compiling of the history of the Jayawardenapura era with special emphasis to Jayawardhanapura new parliament. It was done by the eminent bilingual writer Tissa Abeysekera and translated into Sinhala by Prof. K.N.O. Dharmadasa. Q: What would be your prime focus as the Governor of Sabaragamuwa? A: My attention will be certainly focussed on the world famous Adam's Peak which is worshipped by the devotees of the four major religions. For Buddhists it is Sri Pada, for Hindu's Siva Nadi Padam, for Muslims Baba de Male and for Christians, Adam's Peak. It is of national importance to cultivate religious harmony among the people of this country. Certainly I shall promote the religious and spiritual advancement of the people in Sabaragamuwa.